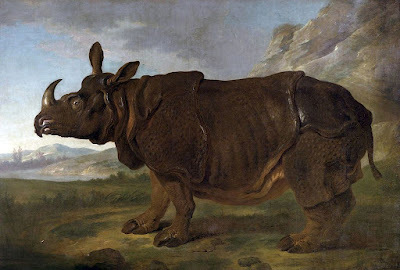 Jean-Baptiste Oudry's famous and much reproduced portrait of Clara was painted from life when the rhinoceros was exhibited in the Foire St-Germain in 1749. The picture is life-size - which in the case of a rhinoceros means pretty large: some ten by fifteen feet! In 2001 the painting was re-discovered in Schwerin on the Baltic coast of Germany and shipped, together with an equally enormous canvas of a lion, to the Getty Museum for conservation. As you can see from the Getty video, this was quite a task! The huge canvasses first had to be unrolled - no mean feat in itself after 150 years - then painstakingly cleaned and repaired, minute scratch by minute scratch. In 2007 Clara was finally ready to be revealed to the public as the centrepiece of an exhibition at the Getty on "Oudry's Painted Menagerie". 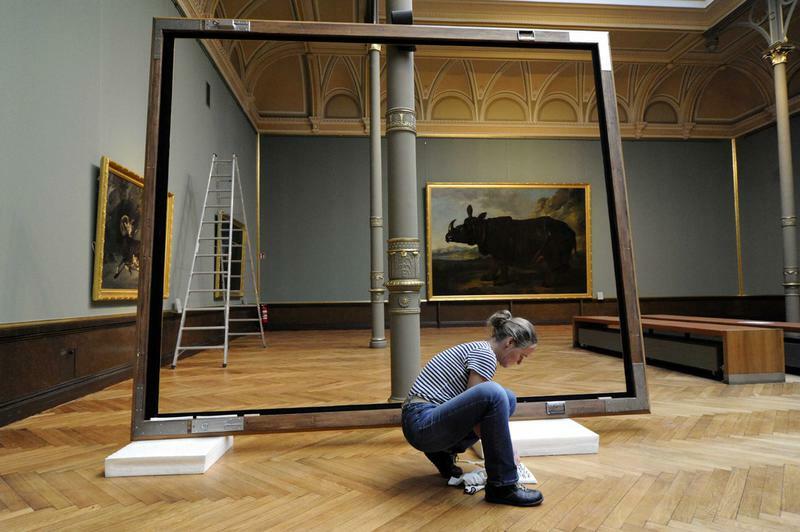 The picture has now been returned to Germany and in 2015 rehung in the refurbished gallery of the Ludwigslust Schloss, the former hunting lodge of the Dukes of Meckleburg-Schwerin. Duke Christian Ludwig II of Mecklenburg-Schwerin (1683-1756) and his son Prince Friedrich were Oudry's greatest foreign patrons. Between 1733 and 1753 they acquired no few than forty-four of his paintings and forty drawings - which today represents the largest collection of his work in existence. In March 1750 Oudry offered the Duke's chamberlain sixteen pictures of which ten "formed a series appropriate for the decoration of a gallery". The series was a set of birds and animals painted from life in the Versailles Menagerie at the request of François Gigot de La Peyronie (1678-1747). Louis's surgeon, "who wished to have the pictures engraved and to provide a series of natural history paintings for the royal botanical gardens" (presumably, though not certainly, a planned gallery at the Jardin du roi). La Peyronie had unfortunately died without taking possession of the commission. The letter also mentions the picture of Clara. All ten of the Menagerie paintings, plus Clara and the portrait of the Versailles lion, which was sold to the Duke in 1752, are now on display in Schwerin. Exhibition Oudry's "painted Menagerie" 1st May - 2nd September 2007. A full online version of the exhibition catalogue has also generously been made available.